The birthplace of stars are dense, violent nurseries. Characterized by outbursts of activity and interstellar shock waves. Our Sun and the Solar System have survived such a violent environment of 4.5 billion years ago. Most of the stars in our immediate cosmic neighborhood probably formed together in a dense cloud of gas and dust. and bright emission nebula in the neighborhood excited by these bright stars. Examples within the Milky Way today. Star-forming region in Orion Nebula. Scores of young stars and protostars embedded in nebula. Infrared image of the so-called Elephant Trunk Nebula. 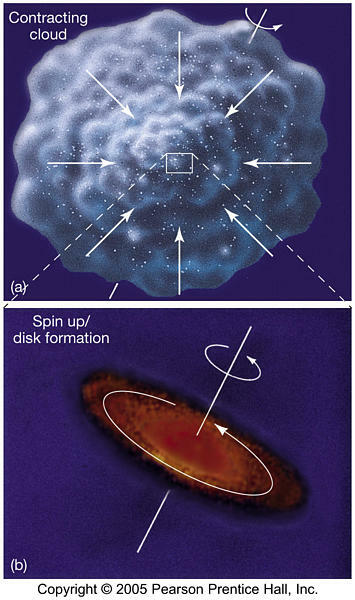 Examples of Extragalactic Star Formation. 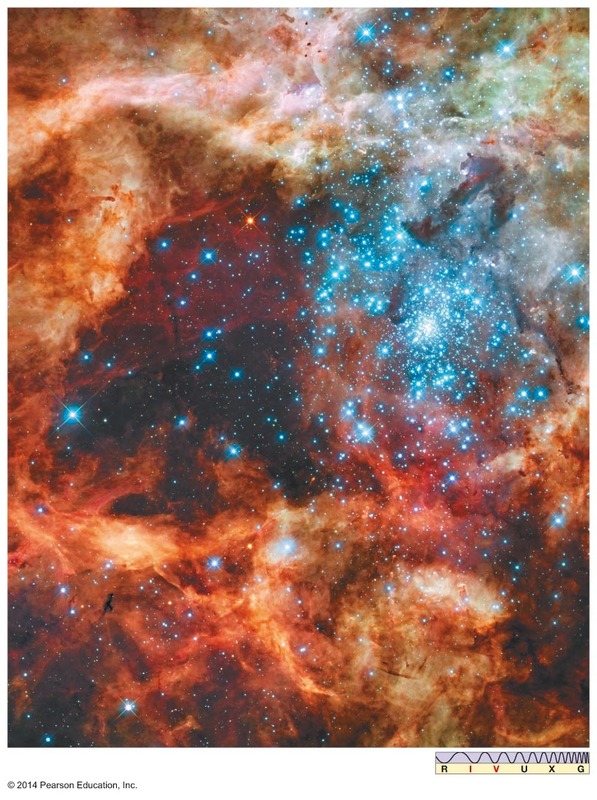 Stellar Nursery in Tarantula Nebula in Large Magellanic Cloud. Less than 2 million years old. Region of interstellar medium collapses under its own weight. Cloud heats as it shrinks. Heating due to release of gravitational energy. Gravity only weakly influences interacting particles. Heat generated in collapse opposes pull of gravity. It takes an enormous collection of particles to create the combined gravitational attraction required to hold them together. 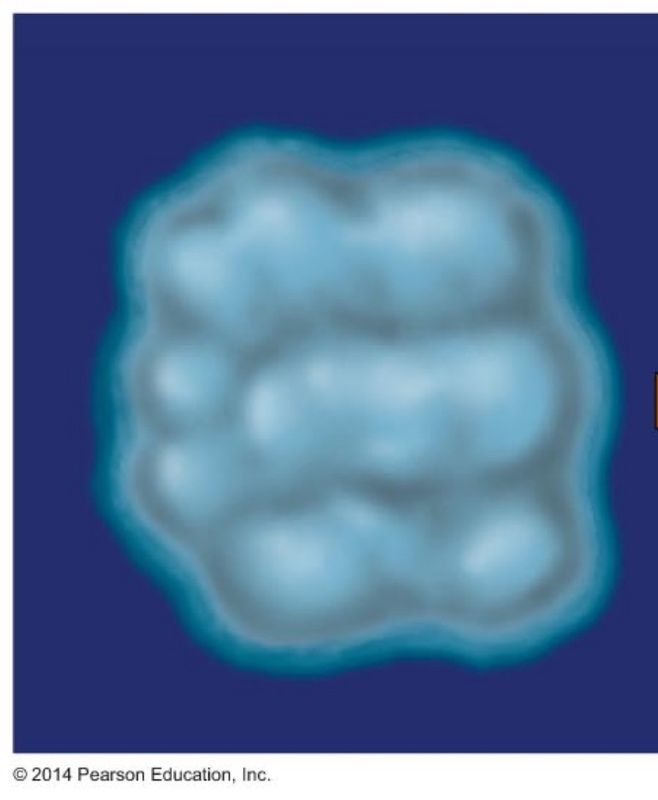 For a 100 K cloud, roughly 1057 atoms are required. Much more than all the atoms contained in the Earth. 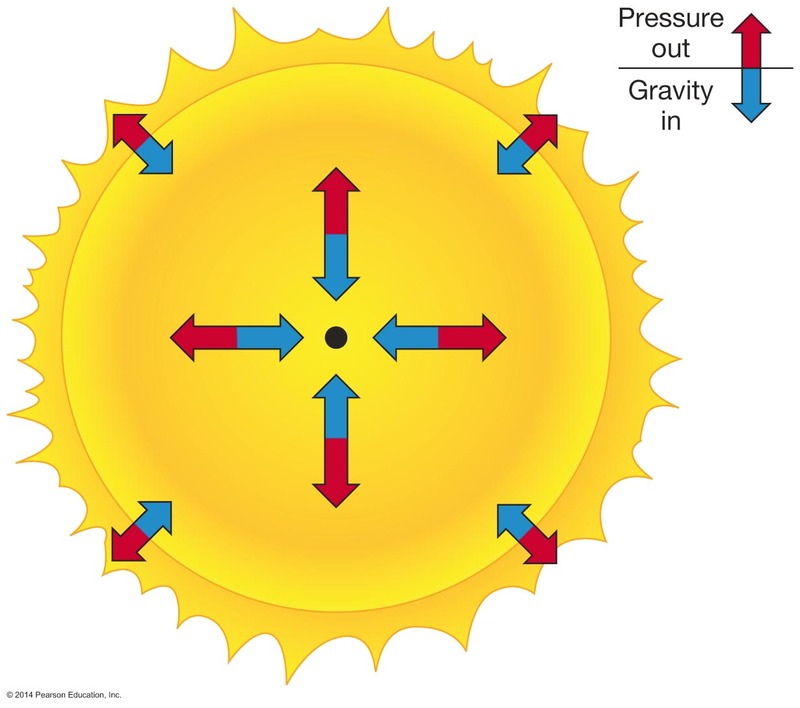 Complications of Spin and Magnetism. Spin competes with inward pull of gravity. Effect of magnetism - hinders contraction. Eventually, if mass is sufficient to produce concentration, it becomes hot enough for nuclear burning (thermonuclear fusion). The H-R diagram is a useful way to summarize the observed properties of prestellar objects, just as it is for stars. 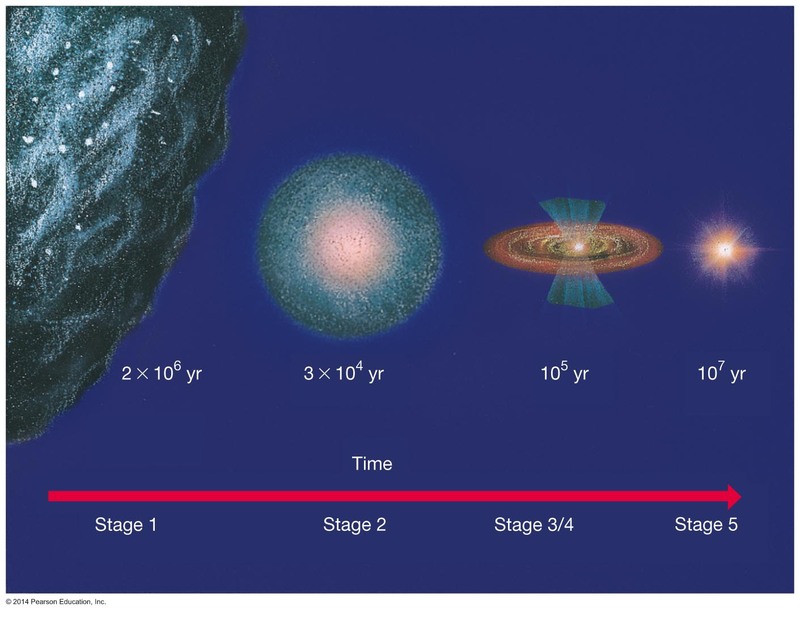 The evolution of a star can be thought of as passing through seven evolutionary stages. 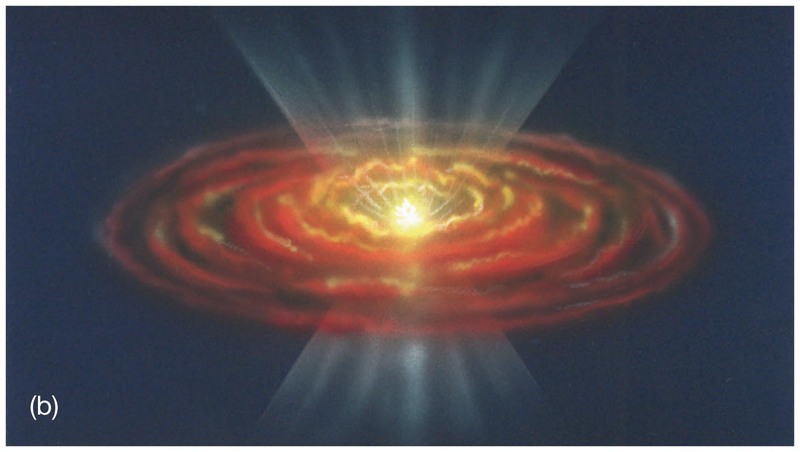 Star formation begins when gravity begins to dominate over heat, causing a cloud to lose its equilibrium and start to contract. A very large interstellar cloud (spanning tens of parsecs) provides the initial stage of star formation. The cloud might contain thousands of times the Sun's mass. The mass is dominately in the form of cold atomic and molecular gas, with some dust. The collapsing cloud will break up into tens, hundreds, or thousands of fragments. At this phase the cloud is very diffuse, so heat is not trapped (except near the center) and temperature does not build much (except at the center). 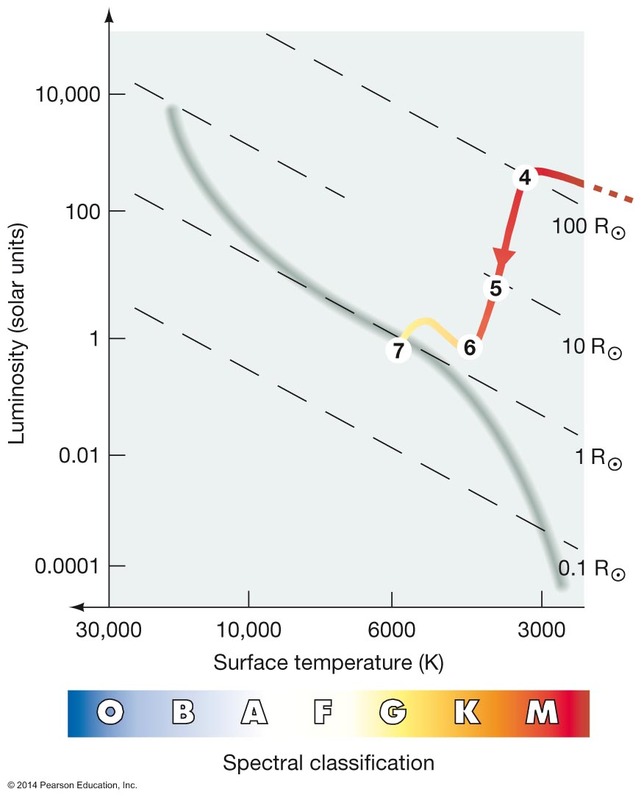 Several tens of thousands of years after the stage 2 fragment began to collapse, it becomes opaque at the center, and the central temperature rises significantly. Cloud has now shrunk to region the size of our Solar System. Protostar appears at the center of the fragment. Approximate evolutionary track of the collapse of an interstellar cloud fragment prior to its reaching stage 4, a protostar. This early evolutionary track is known as the Kelvin-Helmhotz contraction phase. The collapsing cloud heats as it contracts. As the protostar moves beyond stage 4, it becomes a T Tauri star, moving toward the main sequence. This path from stage 4 to 6 is known as the Hayashi track. Characterized by violent surface activity and strong protostellar winds. Central temperature is still not hot enough for thermonuclear fusion. Repulsion of two positively charged protons (Hydrogen nuclei) cannot be overcome. Larger, but cooler, than Sun, resulting in somewhat lower luminosity. Star contracts a bit and comes into hydrostatic equilibrium. 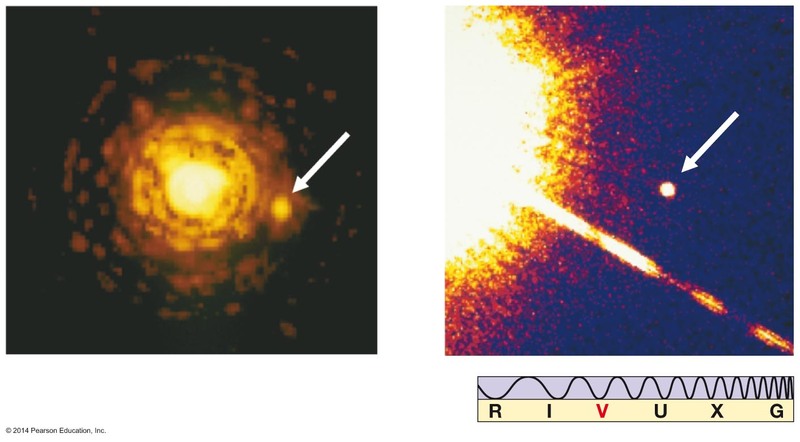 Stars of different masses appear at different points on the H-R diagram. 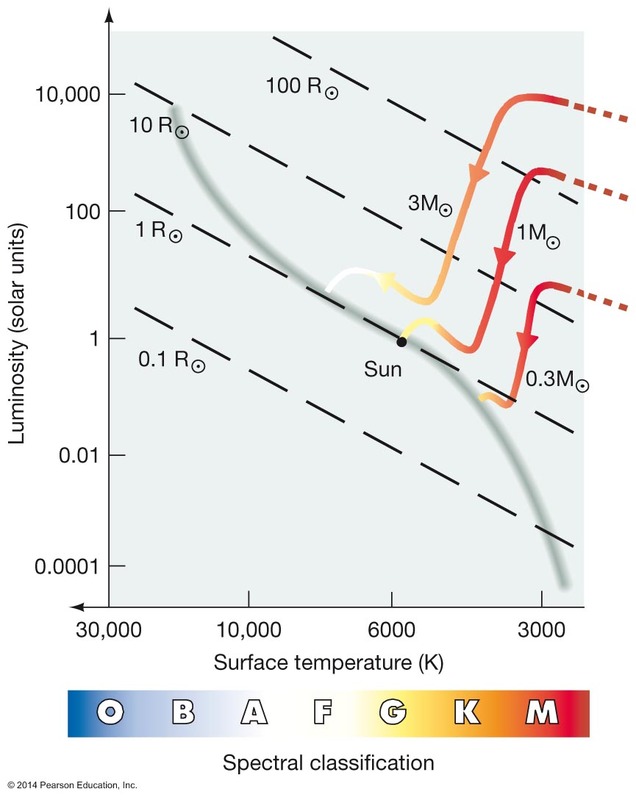 Stars of different masses from the Sun follow different evolutionary tracks on the H-R diagram. 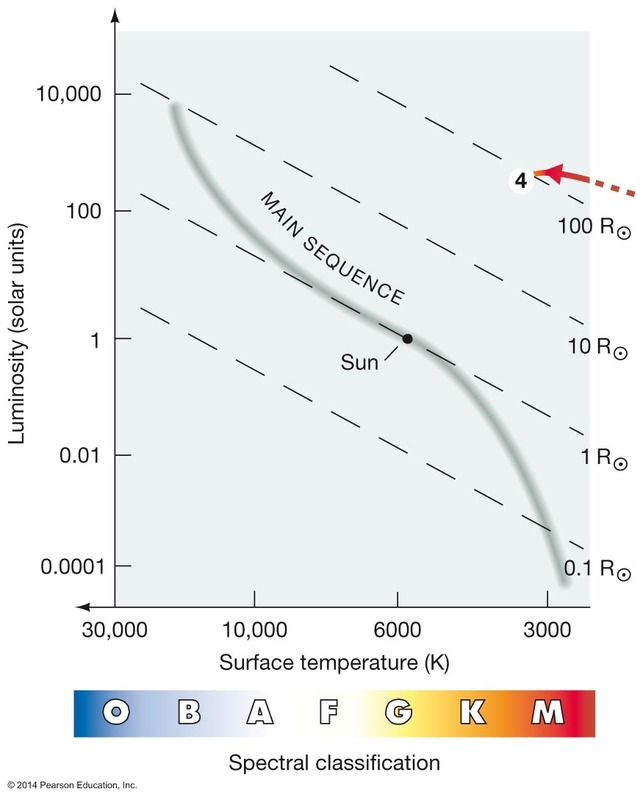 Arrive at different points on the main sequence. 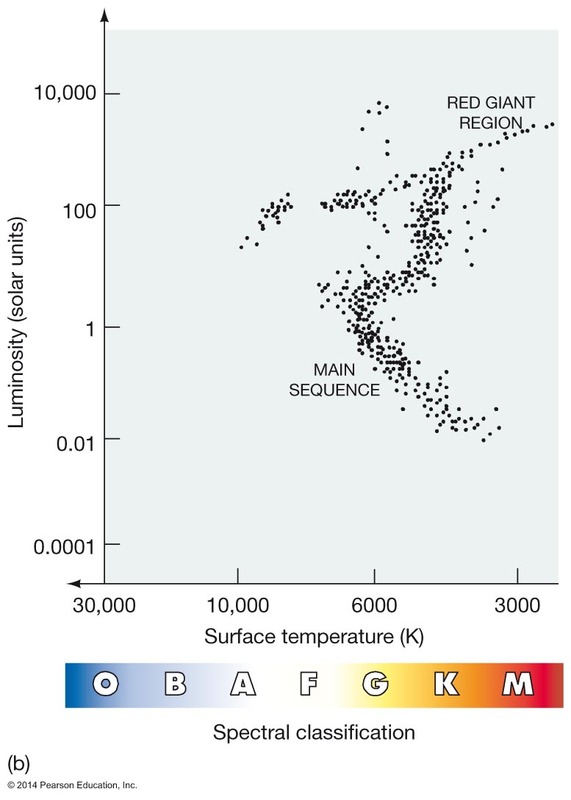 Main-sequence band predicted for stars. Stars will be slightly off-set from this band depending on the concentration of the small fraction of heavy elements. Star "stays put" on the main-sequence, spending most of its life in one place. Mass less than 0.08 solar masses. But more than .012 solar masses (12 times Jupiter's mass). 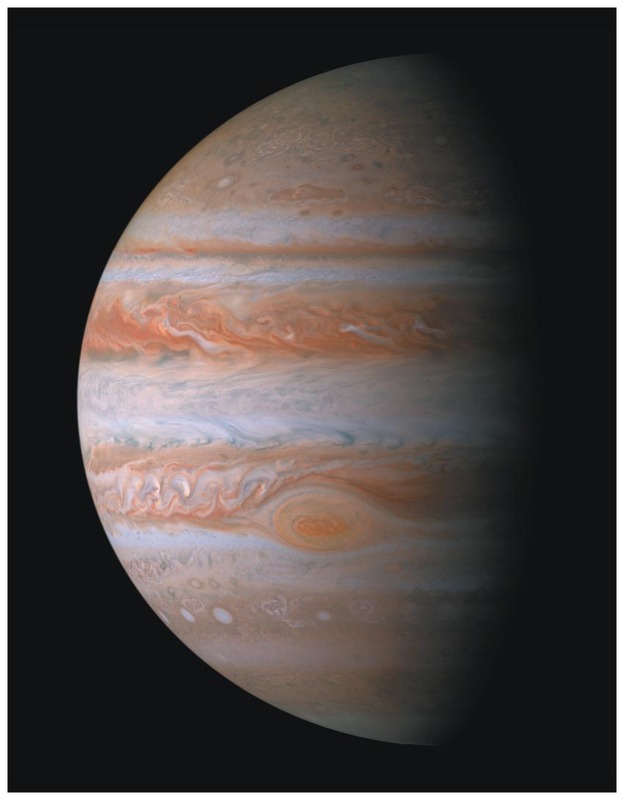 Jupiter is technically not a brown dwarf (0.001 solar masses). 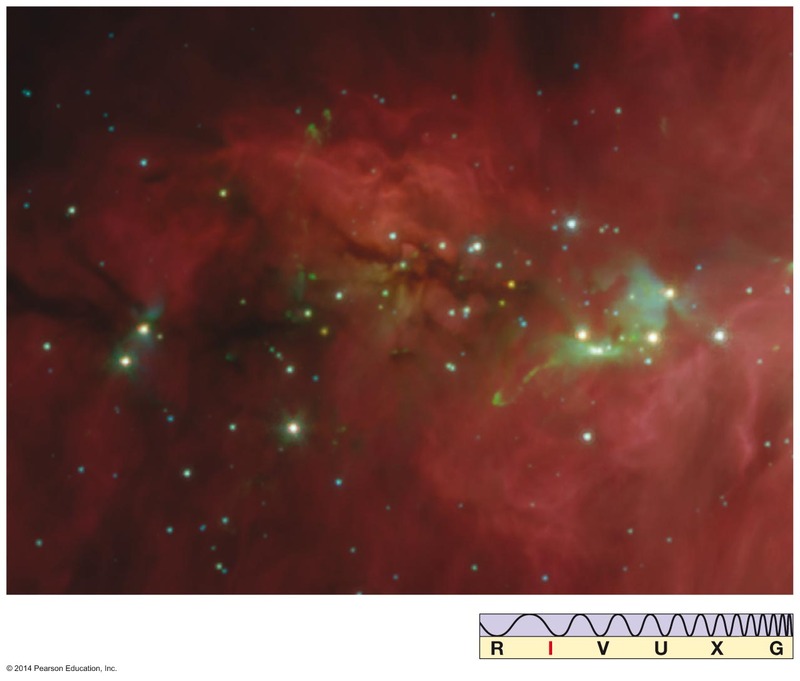 Number of brown dwarfs in the Milky Way may be comparable to the number of stars. Infrared image of star cluster near Orion Nebula. Faint specks are brown dwarf candidates. 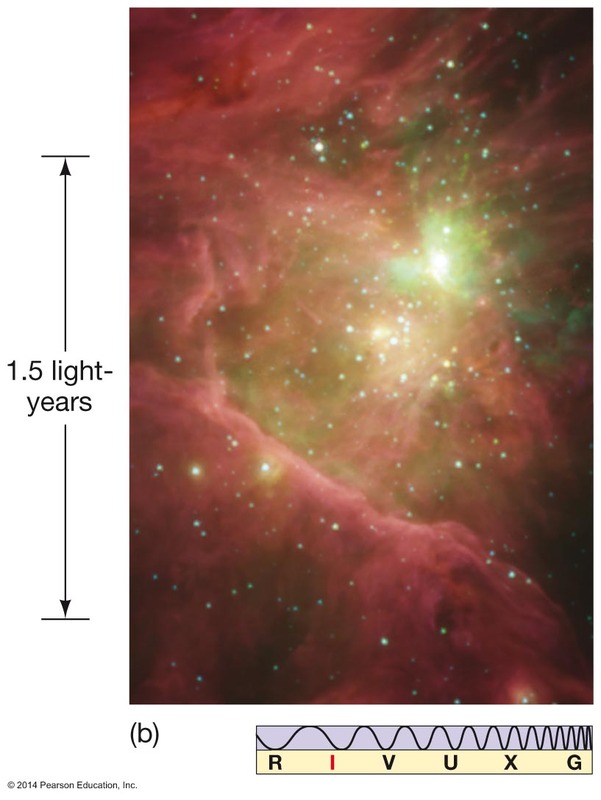 10-15 percent of "stars" in Orion are brown dwarfs. 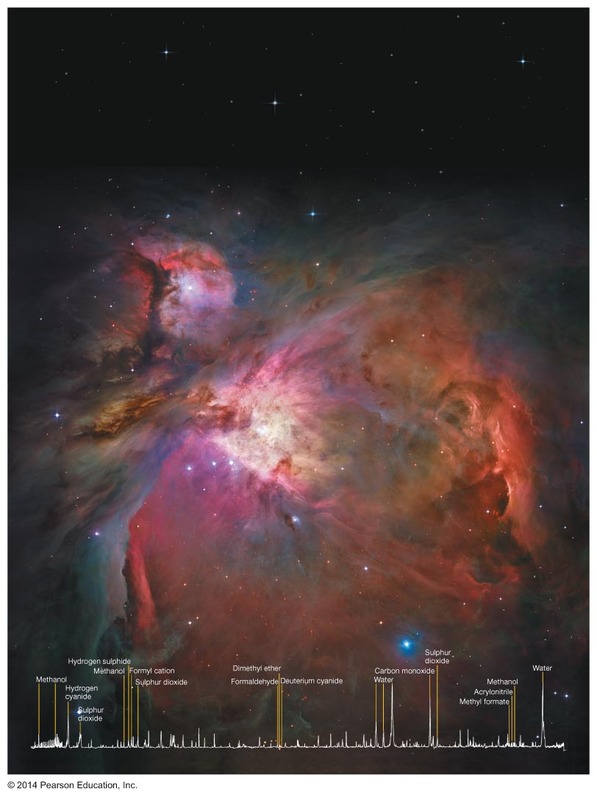 Hubble Space Telescope image in infrared of brown dwarfs in Trapezium of Orion Nebula. About 50 brown dwarfs seen at distance of 1,500 light years. Period of cloud contraction is far too long for us to "watch". Our computer calculations predict it. We can observe it at various stages of evolution. 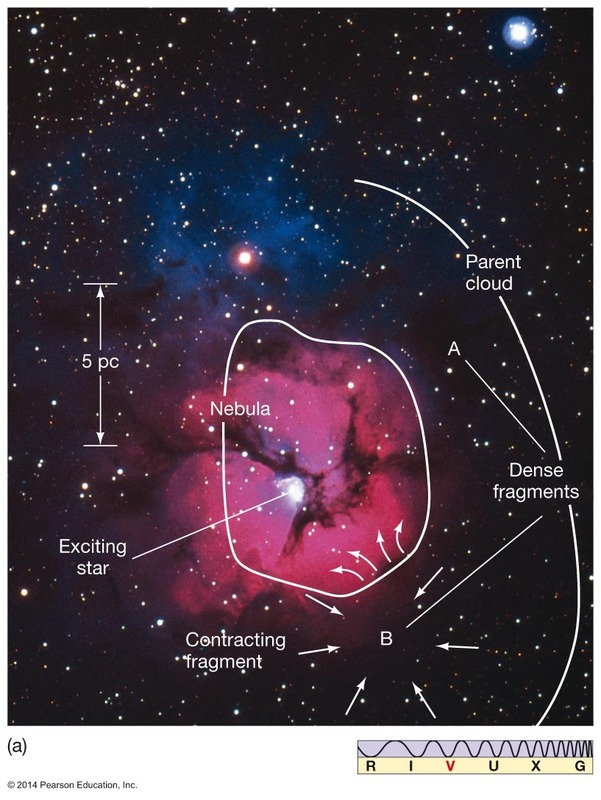 M20 (The Trifid Nebula), evidence for three broad phases of star formation. Contracting fragment (between stages 1 and 2). Emission nebula (stages 6 and 7). 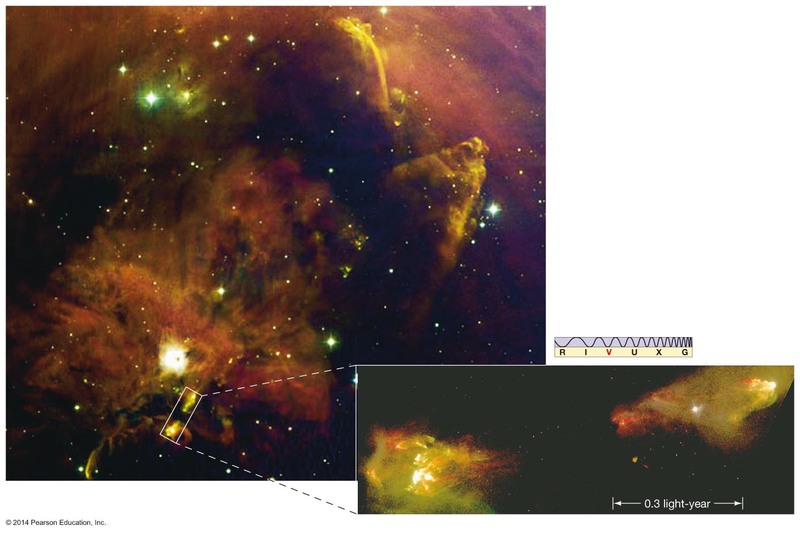 Protostars within the Orion Molecular Cloud imaged by the Hubble Space Telescope. Formation of bipolar jets due to intense heating and strong outflows. Jets fan out as the disk of nebular gas is blown away. New star appears with spherical wind. Actual image of hit young star. 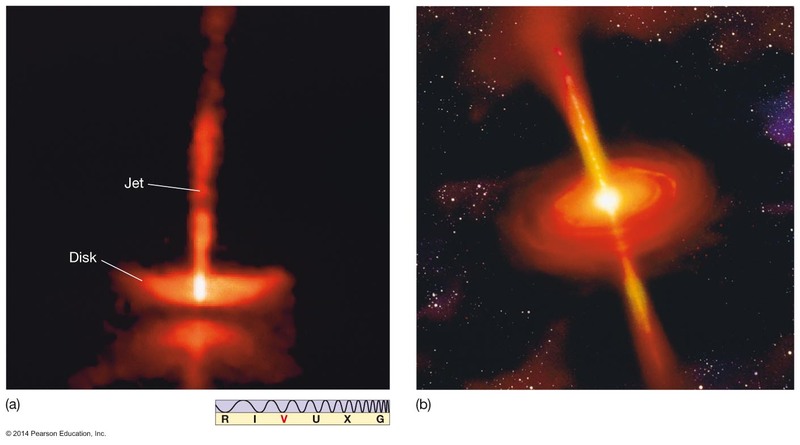 HH30, illustrating a real example of the bipolar flow, along with an artist's conception of a young star system. Another pair of outflow jets, HH1 and HH2, in the Orion molecular cloud. Shock waves driven out by high temperatures and pressures in an emission nebula may compress interstellar clouds to greater densities, triggering star formation. "Contracting fragment" may have been triggered by M20. Interstellar shock waves, which can trigger star formation, may come from several sources..
Star formation might resemble a chain reaction. Star-forming region in galaxy NGC 4214 (13 million light-years distant), which may represent several generations in a chain of star formation. End result of collapse of cloud is a group of stars known as a star cluster. Contains about 2000 bright stars. Example of an open cluster. 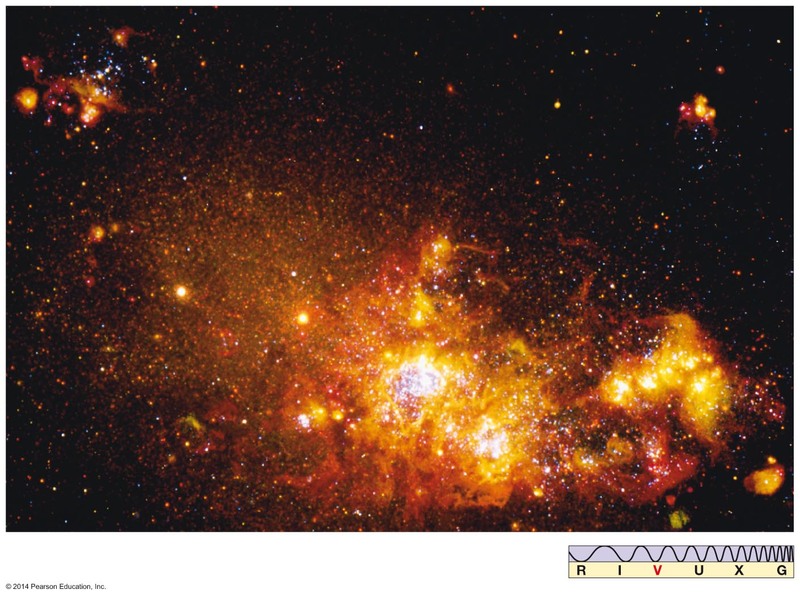 H-R diagram reveals this is young cluster, less than 100 million years. 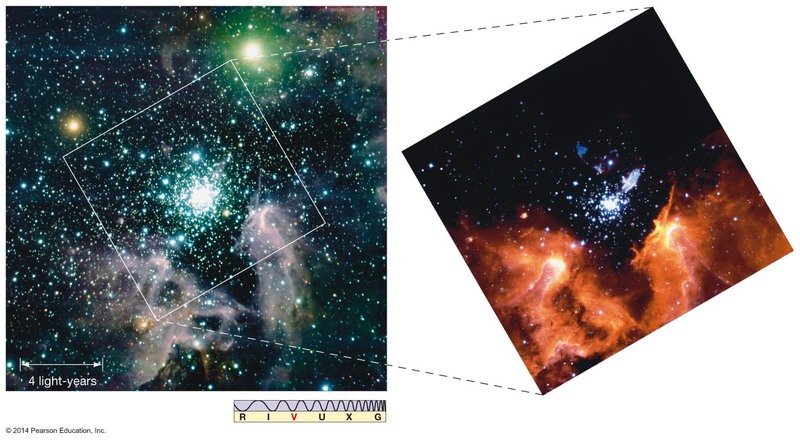 H-R diagram shows age is about 10 billion years - oldest stars in the galaxy. 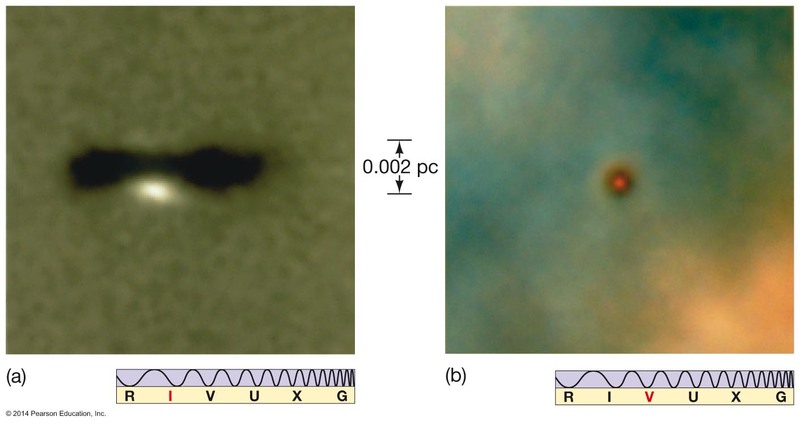 Physical interactions (close encounters and collisions) between protostars are important in determining outcome of formation. 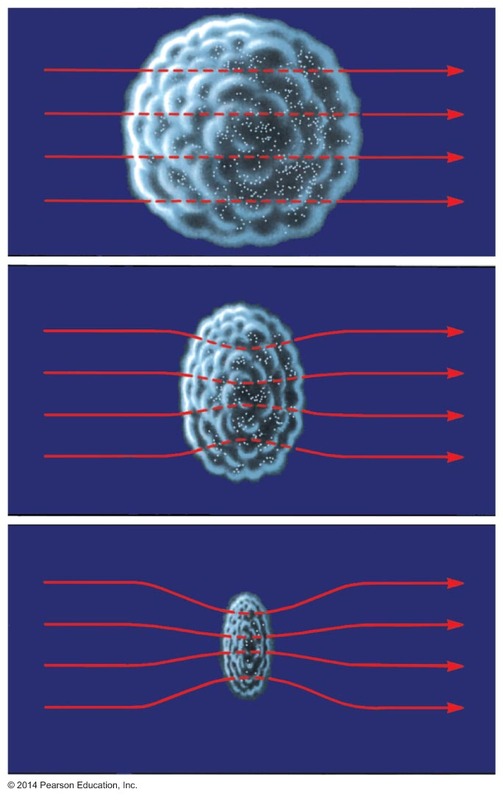 Supercomputer simulations of star formations. 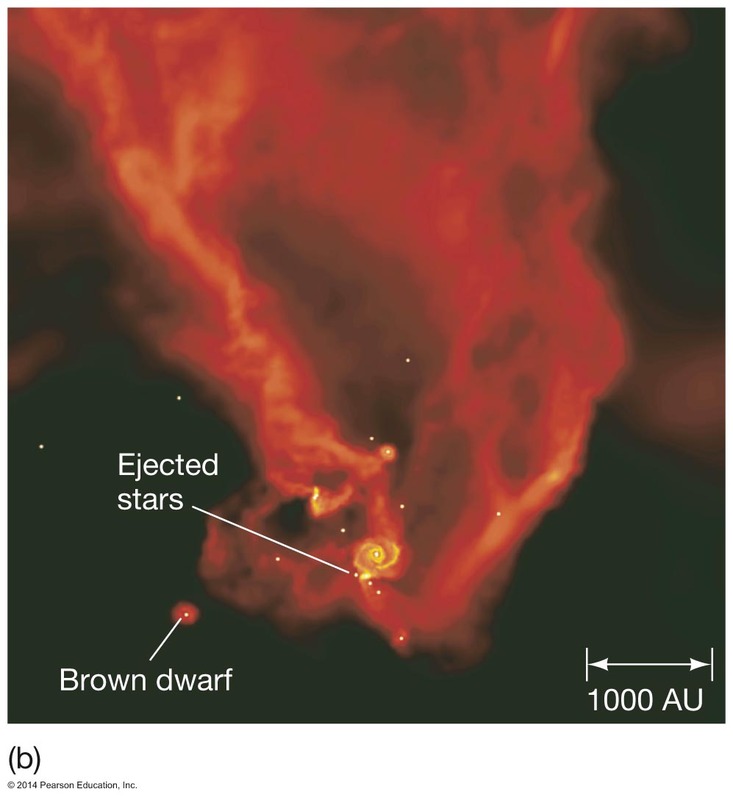 Large protostars may grow by "stealing" gas from the smaller ones, for example. 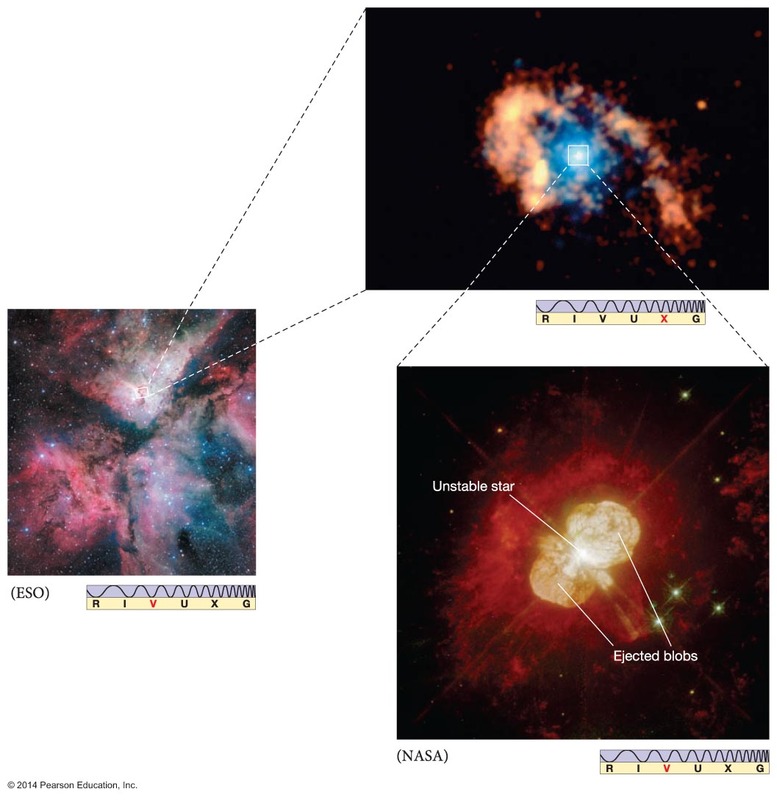 The innermost core, Eta Carinae, has a mass of about 100 times the Sun, and a luminosity of 5 million times, one of the most massive stars known. Has brighten significantly several times in last few hundred years. Probably formed only a few hundred thousand years ago, since its lifetime can only be about a million years. 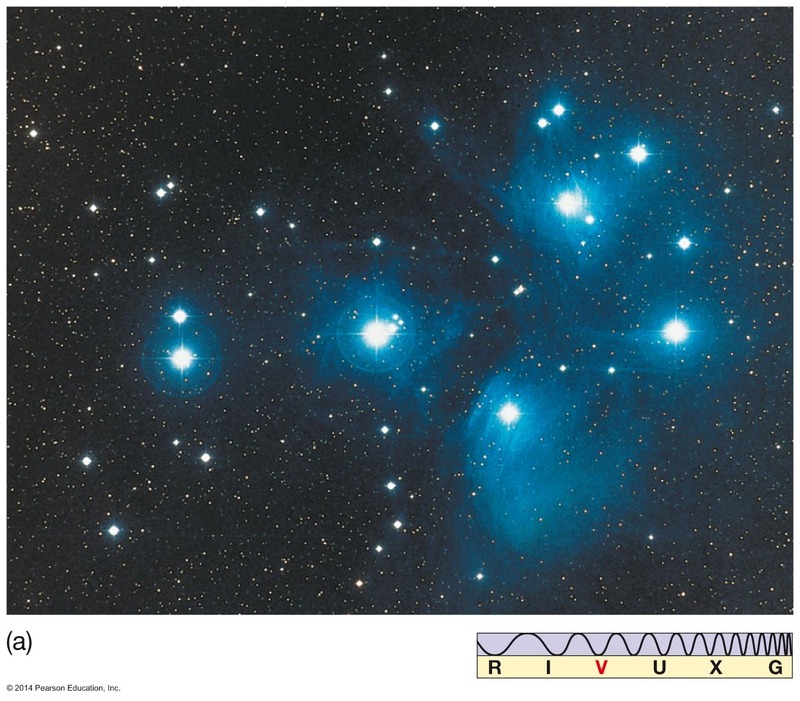 The Trapezium, 4 bright O-type stars responsible for ionizing the nebula, are clearly seen. The infrared image shows an extensive cluster of young stars. Image probably includes many brown dwarfs. 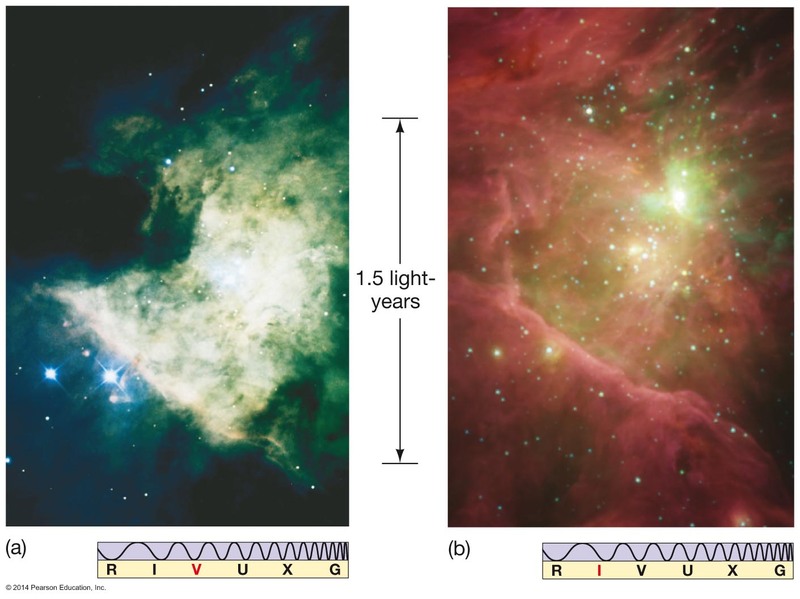 Eventually, emission nebulae will give rise to large open star clusters. Most open clusters tend to disperse over a few hundred-million (100,000,000) years. More massive clusters will persist for somewhat longer. Being more tightly bound by the gravitational pull of the cluster. 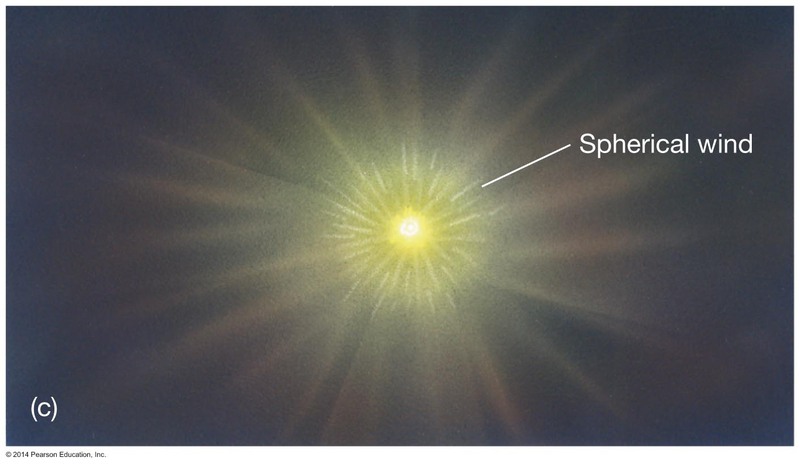 The Sun must have been a member of a cluster at one time, but now is a lonely, isolated star. Over time, these clustering stars will become isolated stars, like the Sun, or isolated small groups, such as binary star systems. 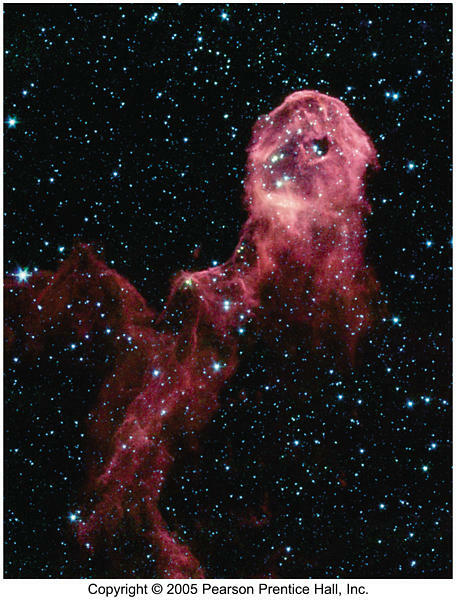 Many examples of star forming regions are observed in space. Stars form when an interstellar cloud collapses under its own gravity, heats, and breaks into pieces of star-sized masses. 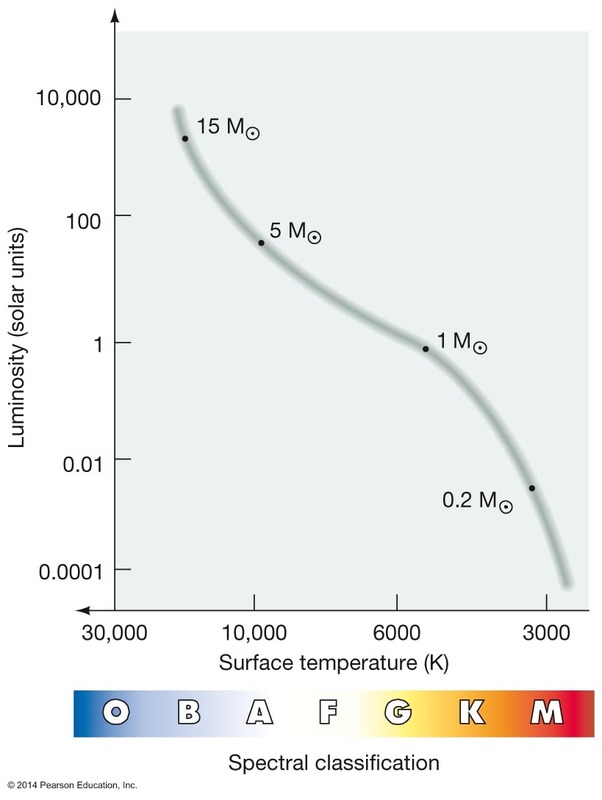 The evolution of the protostar can be represented as a path on the Hertzsprung-Russell diagram. 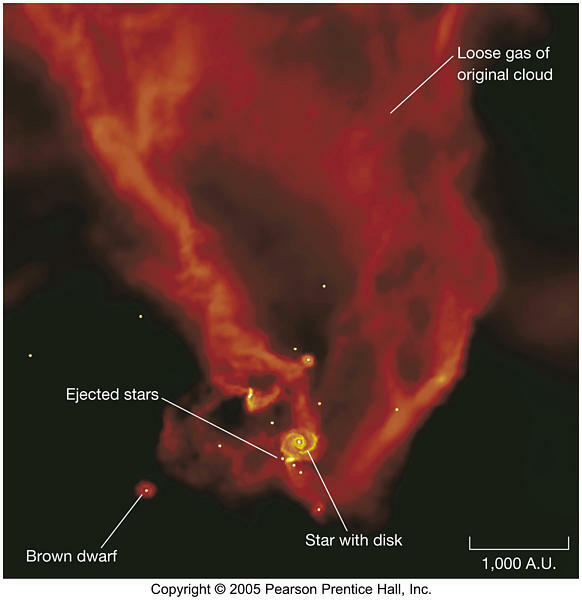 The resulting protostar, which emits primarily infrared radiation is known as a T Tauri star. 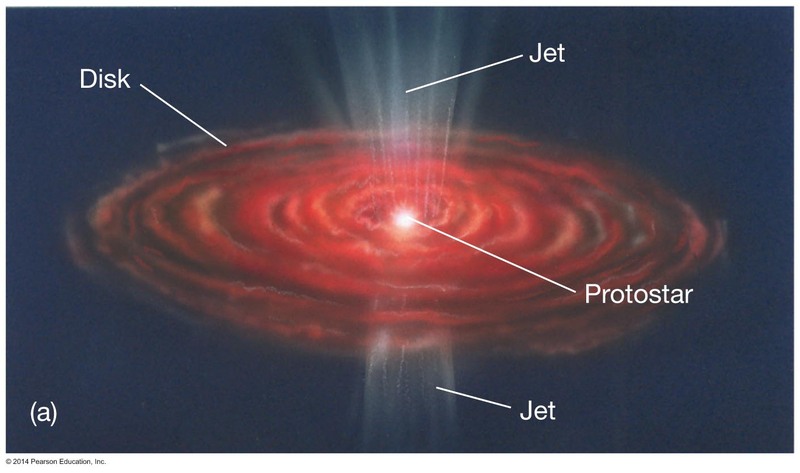 Process takes about 50 million years for a star like the Sun, as a disk forms, and jets of matter are expelled in the direction perpendicular to the disk. 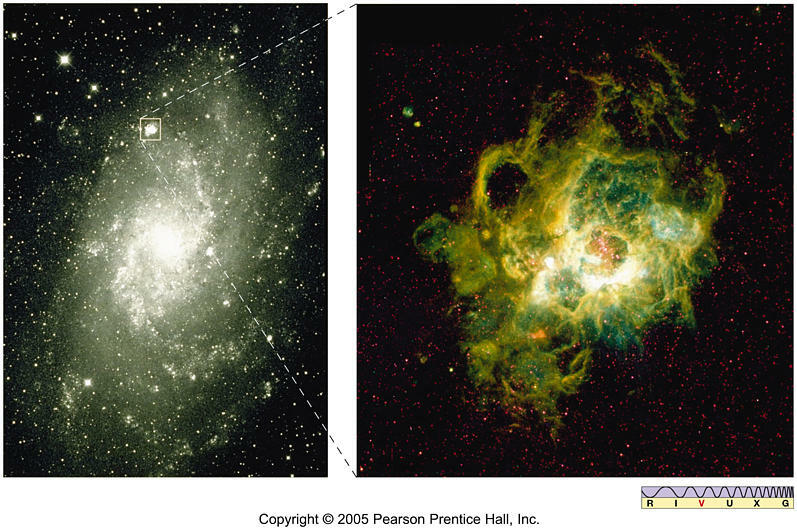 More massive stars form more quickly, while less massive stars take longer, all the result of the cloud's self gravity. Some objects (brown dwarfs, essentially "failed stars") are not massive enough to reach nuclear ignition. 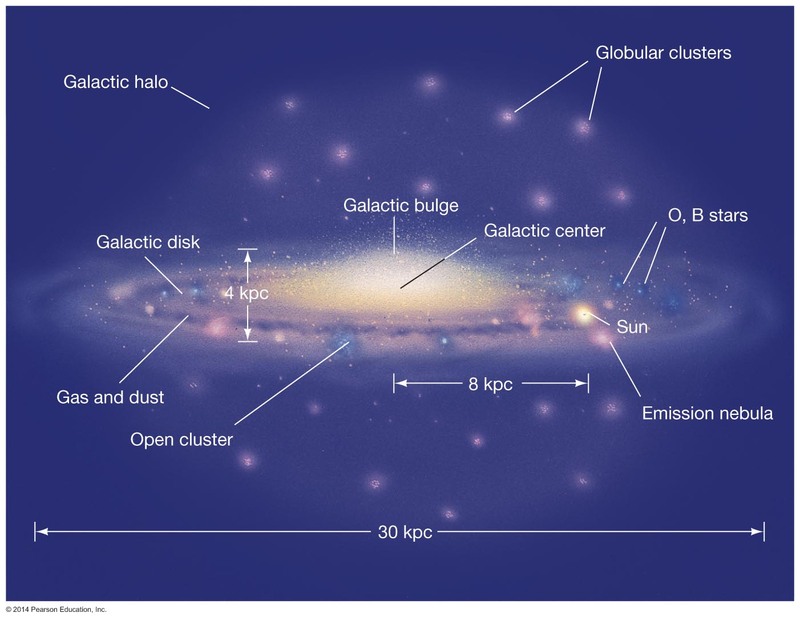 Vast numbers (difficult to observe) may populate the Milky Way galaxy. 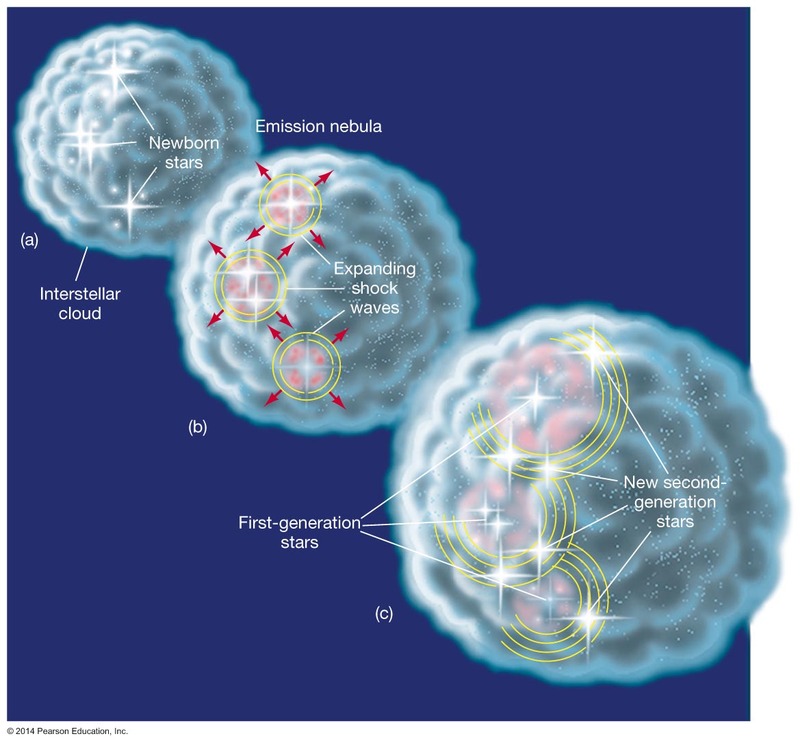 Many stages of the stellar evolution are observed by radio and infrared telescopes. 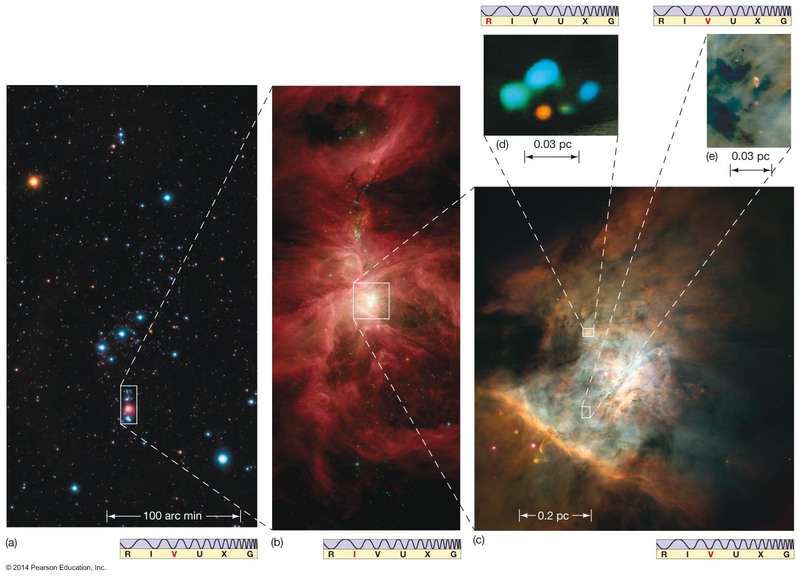 Very massive stars can trigger a chain reaction of star formation. A contracting cloud can lead to hundreds or thousands of stars (a star cluster). In plane of Milky Way. Hundreds to thousands of stars. Out of plane of Milky Way. 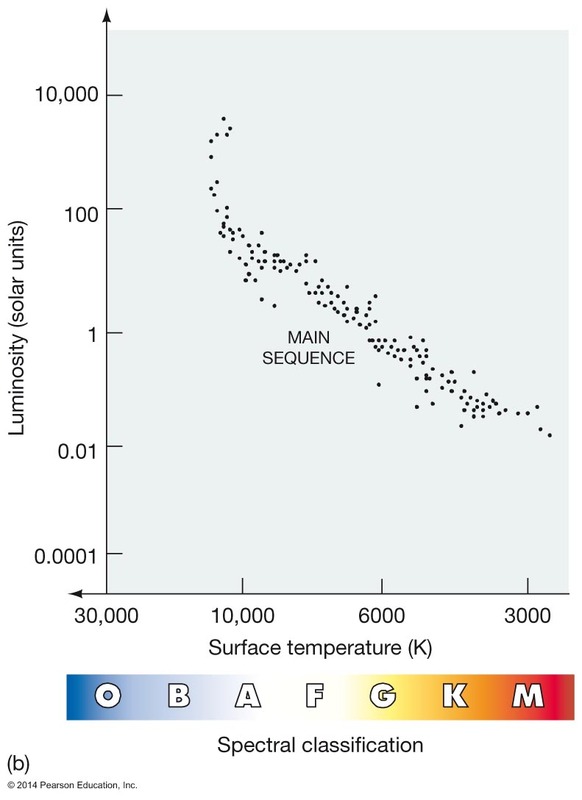 No main-sequence stars more massive than the Sun.